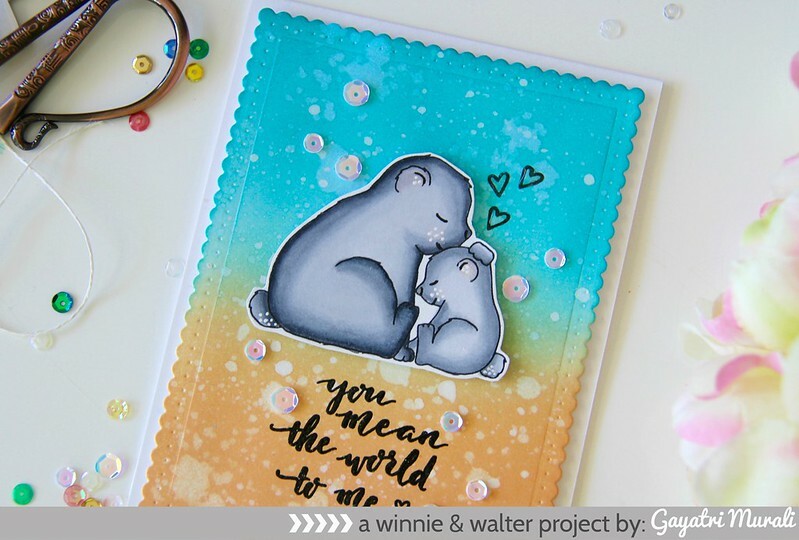 Winnie & Walter Release day post. It’s release day at Winnie & Walter. Yes! All the new products that was premiered for past four days are now available for purchase. Check out Winnie & Walter store. 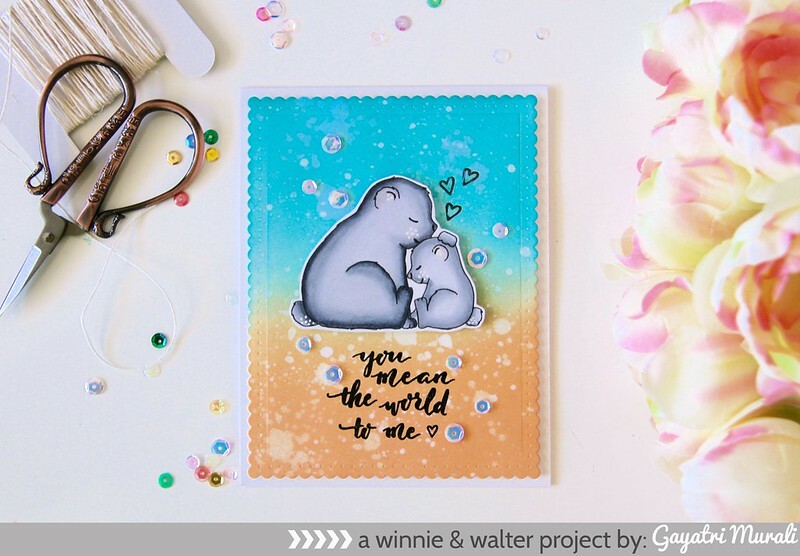 As a bonus for the release, I have a card using Big Hugs with Evelin T Designs stamp set from the new release. 1. Card base is made using white cardstock. 2. Die cut a scallop rectangle panel using white cardstock and largest of the scallop rectangle die from Essentials: Audrey Cutaway. 3. I sponged the Dried Marigold and Peacock Feather distress inks on the panel and spattered some clean water for added texture. 4. I then black heat embossed the sentiment from the stamp set on the bottom centre of the panel. 5. I stamped the bear image from the stamp set on white cardstock, copic coloured and fuzzy cut the image out. 6. I adhered this stamped image on top of the image using foam adhesive. 7. I also black heat embossed the heart shapes from the stamp set on top of the bear image. 8. This panel is adhered on the card front and embellished with sequins. This release is one of my favourite. So many cute images to colour and fantastic sentiments. I enjoyed making my projects using these new release products. Thanks so much for visiting my blog for past few days. Hope you are inspired by my work. This is such a sweet card Gayatri! I just bought some goodies from them today so I can't wait to start making cute cards, absolutely new to me!